Some of our patients are listed below and are updated as able. The wing was frozen and the tissue died. 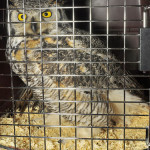 The owl was euthanized on 2/11. The hack tower at Whiterock Conservancy cannot be used for osprey as there is an eagle nest too near. The tower was repaired and renovated for a soft release for the barn owls. Four of the five were placed in the tower on the 25th. 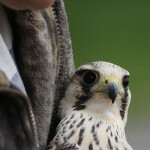 The tower was deemed too small for all five, so one of the females was held for release at SOAR. "Feisty" is in pigeon school and a soft release will be done in the next few days. 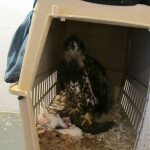 A soft release is where the bird can leave from the flight pen when ready and food will be provided if and as needed until that raptor has departed from the area. An update on "Jasper"... Kay and friends opened the gate on the hack tower on the 26th. "Jasper" flew out and made a nice arc and landed on the ground. Even though he was more than ready to leave the tower, his muscles weren't ready for flight. "Jasper" is back in the 100-ft flight pen at SOAR for flight practice. 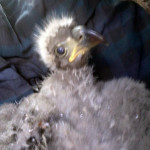 The eaglet did have a slight droop to one wing at admit, but that appeared to have resolved or so we thought. He just needs more time to rehab. After consulting with other rehabilitators with baby eagle experience, it was determined that when he was flying in the flight pen with ease, we needed to do a soft release. This meant setting up a feeding station on the roof of the adults pen. He could still see and hear the adults and he would have food available, if needed. 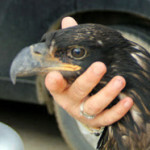 The young eagle had been easily navigating the flight pen and was time for a pre-release exam. 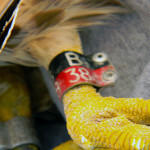 The exam indicated the eagle was healthy, fully feathered, and weighed in at 7.25 lbs. Released at SOAR! As with all the care provided for this young eagle, this release was planned with his best interest in mind and, it was done to try and minimize any human influence on this still growing bird... low stress and near easy food sources of ponds, creeks, and rivers... several of which are drying up and makes for easy fishing. 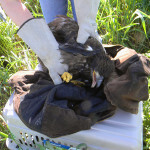 In preparation for release tomorrow, this eagle was weighed (10.75 lbs!) and USFWS band put on before loading into the carry crate. See photos below.